The DRWI is a remarkable collaboration among 50 nonprofit organizations to protect water quality within the Delaware River basin—a 13,500-square-mile watershed, stretching from New York State to the Delaware Bay, that is the source of drinking water for five percent of the U.S. population. Science is at the core of the DRWI: the goal is not only to accelerate conservation through land protection and environmental restoration, but also to measure the results. Within eight sub-watershed "clusters" are hundreds of projects that run the gamut of land uses and watershed threats, from highly paved urban centers to agricultural landscapes managing chemicals and livestock waste. My role was to design a full kit of printed collateral soliciting support for the DRWI, which required organizing the content conceptually and styling the maps. The final package includes an overview booklet, fold-out posters for the eight clusters, and booklets for the DRWI's four leading organizations. A custom, die-cut, three-pocket folder enclosed all of these materials. Printing used soy-based inks, and the paper stock was certified by the Forest Stewardship Council. Poster-sized maps for each of the eight individual sub-watershed "clusters" used GIS data—and SAYGRID's secret sauce. The full set of collateral was themed by color: blue for the eight sub-watershed maps, yellow for the leading partner brochures, and green for the overview booklet. 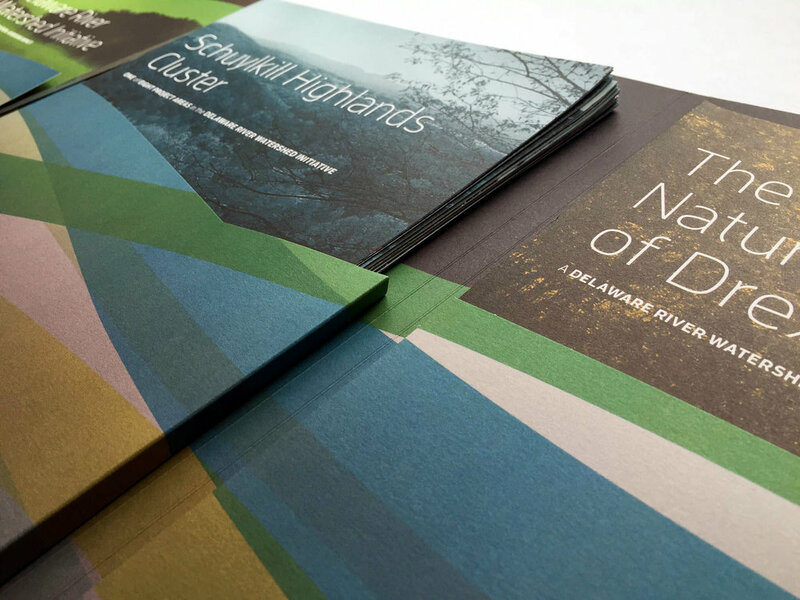 The collateral included an overview booklet for each of the four major partners that led the DRWI: the William Penn Foundation, the Academy of Natural Sciences at Drexel University, the National Fish and Wildlife Foundation, and the Open Space Institute. "Andee is an essential partner, helping us to shape and convey important and complex messages about our strategic goals and aims."